We do not sell any software solutions and we use the latest technology ourselves, which allows us to give impartial advice to our clients. A wide range of professional talent from across the world coupled with our own audio studios means we are a one-stop-shop for all localization projects regardless of size, type and languages required. Mission Statement: To be a Language Services Provider well-regarded worldwide for quality, timeliness and professionalism. Entertainment, Internet/E-commerce, Software (games), Tourism, Training/Education, Advertising (marketing), Advertising (media), Aerospace, Agriculture, Architecture, Art/literary, Automotive, Biotechnology, Business products, Chemical, Compliance, Construction, Consumer products, Defense, Electronics, Energy, Engineering, Environmental, Environmental Engineering, Fashion, Finance (Microfinance), Finance / Banking / Accounting, Financial/markets, Government, Healthcare, Higher Education, Homeopathy, Hospitality, Information technology, Insurance, Investment / Securities, Journalism, Law/Legal, Logistics, Machine tools, Management, Manufacturing/Industrial, Marketing/Communications, Medical/Life Sciences/Pharmaceutical, Metallurgy/casting, Oil, Paper/paper mills, Pharmaceutical, Philosophy, Real estate, Religion, Safety, SAP ERP, Security, Social sciences, Software, Software (educational), Software (multimedia), Sports, Telecommunications. Desktop publishing (DTP), Document translation, Editing, Engineering, Glossary/Terminology, Graphics/3D animation, Graphics/Screen capture, Internationalization, Linguistic Testing, Localization, Multimedia localization, Project Management, Proofreading, QA Testing, Search Engine Optimization, Subtitling, Transcriptions, Translation, Typesetting, Voiceover/dubbing. Translation has been at the core of Andovar’s services since our founding and forms the backbone of any of our language service offerings. Our expert project managers use a variety of language technology tools and proven localization processes to ensure quality and your satisfaction. Most of Andovar’s linguistic resources are based in their home countries where they keep in touch with how languages are used. Our database of linguists spans a wide range of subject matter areas, and is constantly evolving as we take on a wider range of work. Linguists are segregated in our roster by their experience, subject knowledge, use of tools etc., so that we can apply resources matching the demands of each project. Andovar maintains a full-time resource management team tasked solely with the identification, testing and management of translators. Our rigorous evaluation program includes a triple-screening system based on subject-area specific tests covering each element of the translation process. The pass rate for this process averages under 8%, or even lower for certain technical or medical subject areas. 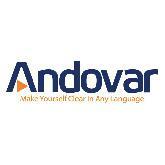 Andovar welcomes client involvement in linguist recruitment and selection. By providing sample content to evaluate linguists on and also reviewing and selecting the best candidates, clients can have an active role in building the most appropriate linguistic team. Andovar is proud of a very low turnaround of staff. Most of our project managers and localization engineers have been with the company for years. Their experience is significantly above the localization industry average. While experience ensures good judgment, the language services industry is undergoing rapid technology advances. Accordingly, Andovar’s employees undergo periodic training on processes and technology to ensure that they are up-to-date on the latest practices. In addition to sourcing of qualified translators by our resource management team, we execute a complete translation memory (TM) analysis and content review at the scoping stage to ensure that we understand every facet of the project. Although Andovar maintains standard localization workflows, they are typically modified to suit clients’ requirements and content type. Thanks to Andovar’s size and emphasis on training and retaining experienced project managers we do not need to rely on cookie-cutter processes. As a global communications partner, we understand the importance of building dependable workflows that enable all stakeholders to work efficiently and effectively towards success. Please visit our section on Quality Management to learn more about our approach to language management. Efficient control of approved terminology is often neglected in an attempt to release localized products in the market as soon as possible. Our approach is different. We believe effort invested into perfecting terminology at the start of a project is recouped many times over the lifetime of an account. Andovar can advise on optimal terminology management and language technology tools, as well as style guides that are most appropriate for your needs. These linguistic assets will then be made available to the linguists for them to use throughout the project. In the case of the termbase, this is directly accessible for linguists via our translation management system environment. Andovar does not believe in a one-size-fits-all solution. Different organizations and industries face unique challenges. Whether you are dealing with budget or time constraints, globally dispersed review teams or just want to save money on translation, we are ready to discuss your business objectives. From adaptive processes to flexible resources and beyond, we will help you find the best solution to your challenges. Having worked on the translation of millions of words into dozens of languages and thousands of hours of courseware and software projects, Andovar understands where things may go wrong and how to prevent it. Our quality assurance checks spread through every stage of every project; from scoping and quotation to production, review and beyond. Our experience shows that if these steps are followed, we are able to maintain the high standards of quality and consistency that our clients expect. Andovar maintains full-time in-house staff solely dedicated to the recruiting, testing and ongoing management of the Andovar’s network of qualified freelance professionals. From subject-area specialization and years of experience, to writing quality and language technology capabilities, we check and test every relevant point of review to ensure the right fit. Each of Andovar’s translators undergoes a meticulous evaluation process, initially involving review of the applicant’s CV and credentials and followed-up by translation and editing tests that cover general language competencies, subject area specializations, and the overall ability to capture the nuance of language. We use a triple-screen evaluation process to ensure fairness and consistency in testing outcomes. Although results might vary slightly by subject-area specialization, the average pass rate for this system is under 8%. Our experience shows that quality should be a consideration right from the beginning when the project is discussed and scoped, throughout localization process, and after delivery to the client. Our database of translators is large enough to handle requests of almost any size.